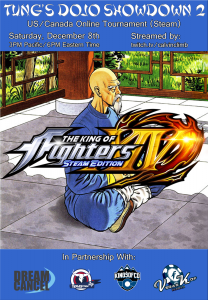 Saturday, November 17th will be our 10th King of Fighters XIV Online Tournament for PS4 players! Saturday, November 17th, starting 2pm Pacific, 4pm Central, 5pm Eastern Standard time. Don’t miss the Sixteenth battle on the 2018 Crazy Battle Circuit, slated to be The King of Fighters XIV on Steam! The tournament is open to players of all skill levels as long as you have stable, wired internet. It will take place on Sunday, August 26th @ 1PM PDT (4PM Eastern). To see more details and sign-up, please see the official website’s page for the game at http://cbc.dx.am/kof14.html or the Challonge page. Don’t miss the Thirteenth battle on the 2018 Crazy Battle Circuit, slated to be Fatal Fury Special on Fightcade 1! The tournament is open to players of all skill levels and worldwide as long as you have stable, wired internet. It will take place on Sunday, July 15th @ 1PM PDT (4PM Eastern). To see more details and sign-up, please see the official website’s page for the game at http://cbc.dx.am/fatfursp.html or the Challonge page.